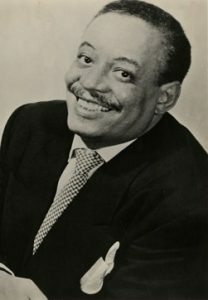 Myron “Tiny” Bradshaw was one of the first artists to move into rock ‘n’ roll from another musical field and also one of the oldest of the original members of the rock club, forty-two years old in 1947 with a twenty year career already behind him that took him from big band swing to mellow pop-jazz, recording only sporadically along the way with none of it finding much success. The advent of rock ‘n’ roll gave him another chance, one he seized with both hands. Unlike some elder statesmen at its outset Bradshaw wasn’t merely hopping on board the rock train as a lark or because it may prove commercially successful, he was fully convinced of its musical potency from the beginning. The bandleader’s infectious enthusiasm for the style propelled him to stardom in the early 1950’s on King Records, delivering some of the most tightly played celebratory songs of the idiom. Scoring a half dozen hits along with a record in “The Train Kept A Rollin” that failed to chart but proved to be one of the first rock “standards”, Bradshaw oversaw one of the most rousing self-contained rock bands of the first decade, featuring a series of tenor sax stars, most notably Red Prysock, that helped to define his sound over the years. Bradshaw’s own somewhat eccentric vocals were hardly the epitome of skill but they too conveyed the party-time atmosphere his songs thrived on. The band’s exuberant stage shows were their stock in trade and they were a touring giant until Bradshaw’s health deteriorated after a 1954 stroke. He died four years later, marking the passing of one of the original rock visionaries.